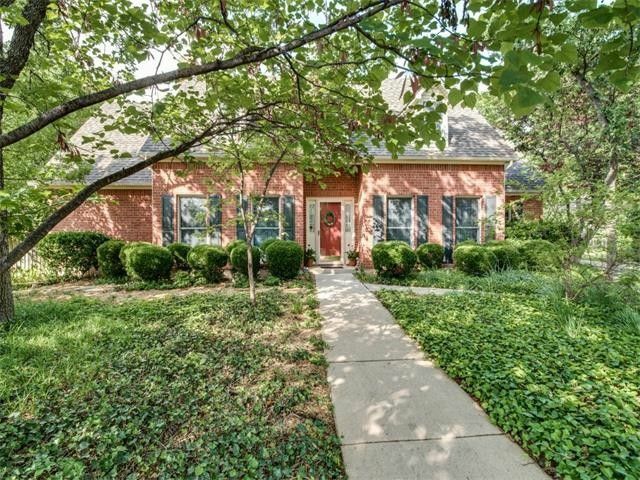 Remarkable custom built Williamsburg styled home in Southridge (Whitney Park) offers 4 bedrooms, 3 full baths, a 25X15 family room with brick fireplace, sunroom with wall of windows for enjoying the private oak-shaded backyard. THe 22X21 tiled patio, covered by a cedar pergola, has plenty of space for a party! The 14x12 dining room, set off the entryway, could easily be a spacious study-office. The chef's kitchen with custom cabinetry opens to the breakfast room & sunroom. Overlooking the back yard, the 17X16 master bedroom has a posh bathroom with jettub, big shower, accessible potty area, double sinks in a long vanity, cedar closet+generous walkin closet. 4th bedroom-gameroom with full bath is on 2nd floor. Directions: From I-35 take Teasley Lane south. Turn left onto Longridge. Turn right onto Savannah Trail that becomes Whitney Court. Home is on the left in the secluded culdesac.